Clean Break have forged a strong reputation for shining a light on the criminal justice system, offering vital female perspectives on stories that are often hidden. Katie Hims’ new play for the company, however, suggests that the most difficult aspect of incarceration might not be prison itself, but the challenge of adjusting to freedom. The eponymous Billy is fresh out of prison – not for the first time – and determined to turn her life around. Brandishing fruit and rhapsodising about her new fitness regime, Billy has a “positive mental attitude”. Unfortunately, her positivity fails to extend to the mother she goes home to, for whom the return of her wayward daughter is the last thing she wants. Banned from crossing the threshold of her family home, Billy instead finds shelter in the caravan pitched up outside, from which she does battle with the past and tries to cling onto hope for the future. Hims’ play is essentially a family drama, tightly focused around Billy, her mother Ingrid and her younger sister Amber. At its best, it explores the complex, fraught and occasionally tender relationships between the trio, all of whom defiantly refuse to conform to straightforward definitions of ‘good’ and ‘bad’. Billy teeters between infectious optimism and a dangerous urge for self-destruction; Ingrid is vulnerable one moment and manipulative the next; Amber is an apparent angel who goes shoplifting when she should be at choir practice. There is certainly love somewhere between them, but it is surrounded by the detritus of blame, resentment and regret. This messy tangle of personalities and emotions would be material enough for a rich exploration of life after prison, but Billy the Girl is restrictively wedded to a structure of secrecy and revelation. The play tantalisingly brushes against moments of raw emotional truth, before frustratingly abandoning them in favour of the punch of a final twist. This denouement, while satisfying the narrative arc that we have come to expect from plays of this kind (damaging secrecy, dropped hints, climactic confession), feels unnecessarily contrived – a trick calculated to inject a fresh burst of drama rather than a revelation that feels truthful to the characters that have been so carefully crafted. Rather than the uneven plot, it is through these characters, convincingly fleshed out by Hims, director Lucy Morrison and the cast, that the play really compels. Billy in particular is relentlessly, almost exhaustingly captivating at the centre of events. As played by Danusia Samal, she seems to feel with every last sinew, investing both hope and despair with unsustainably explosive energy. Christine Entwisle’s Ingrid is her polar opposite, each movement sighing with the fatigue of the years, while Naomi Ackie as Amber ricochets between the two, cheerfully but frantically attempting to reconcile them. The emotional baggage heaved on stage by the three characters is reflected in Joanna Scotcher’s detailed, conspicuously cluttered design. The back garden of Ingrid’s home, dominated by the structure of the caravan where Billy takes refuge, is full of stuff. At first glance it seems straightforwardly naturalistic, but as the play goes on the boxes upon boxes that crowd the stage make their presence increasingly felt; this is no normal backyard mess, but rather a space that resonates with the conflicted states of mind of the women who populate it. The caravan too is loaded with meaning beyond its practical use, becoming a self-contained but flimsy symbol of escape – suggesting movement while ironically rooted to the spot. Speaking as part of a panel discussion after the show, Hims explained that it was important to her that the play, despite all its heartbreak, should offer a hopeful note. This is evident both within the plot and – more successfully – at the level of character. 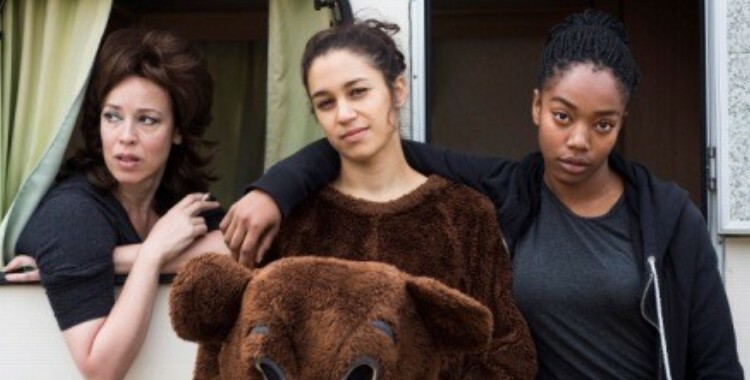 Whatever its other flaws, Billy the Girl offers us three female protagonists with humour and resilience; characters who are allowed to be vulnerable without ever feeling like victims and who come messily, complicatedly and brilliantly to life on stage.